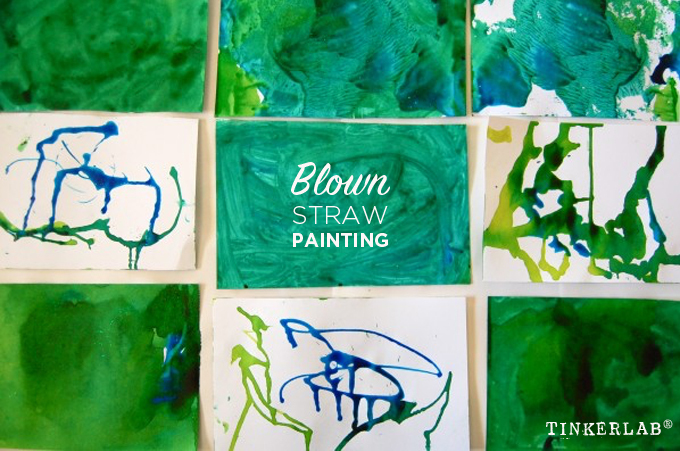 Make gorgeous drips and swirling designs by painting with straws. 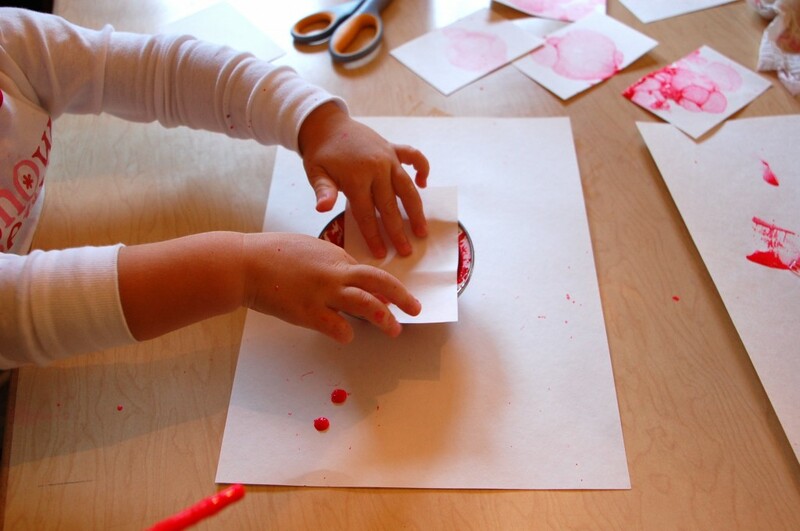 This is a wonderful preschool art activity, but fun for all ages. Watercolor paper or card stock — we used 8.5 x 11 card stock from the office supply store. 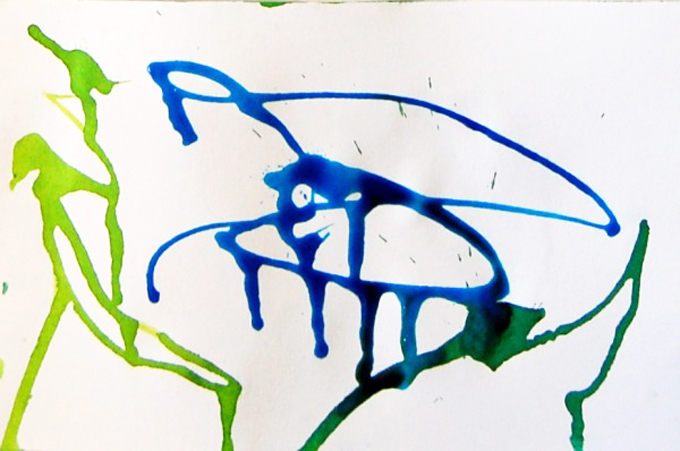 A heavier weight paper will do a good job absorbing the paint and water. 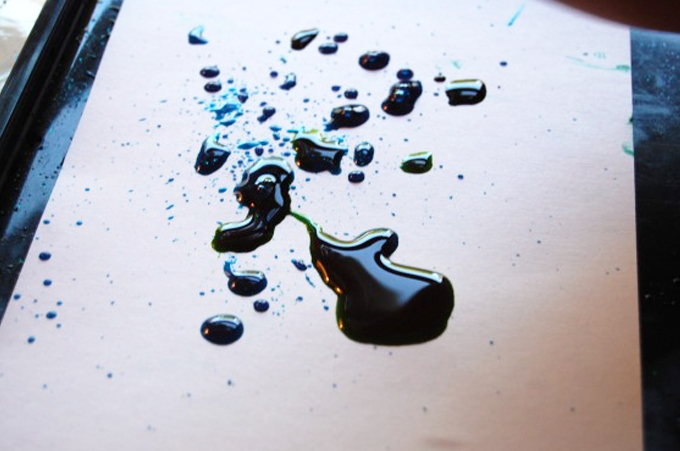 Liquid watercolors. 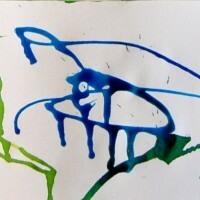 We like to use Sax Concentrated Liquid Watercolors from Amazon. They’re washable and non-toxic. Eye droppers or pipettes. If you don’t have a pipette, you can forage your medicine cabinet for a medicine dropper. Place a few bowls filled with a bit of liquid watercolors nearby. Place a pipette in or next to the watercolors. 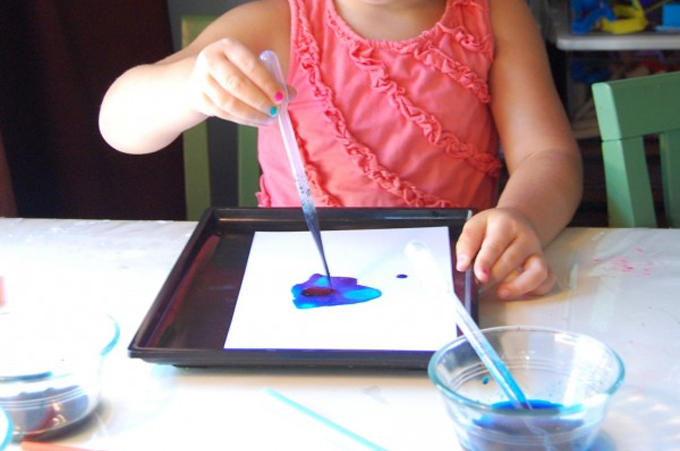 Invite your child to draw watercolor paint into the dropper and then squeeze it on the paper. 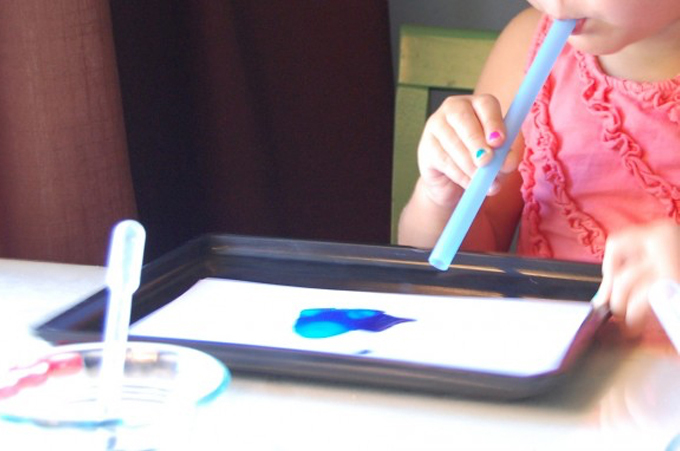 With a straw, blow the paint around the paper. Test regular narrow straws against fat milkshake straws. Which works better? Our favorite was the fat straw. Fold in half and turn your paintings into cards. See 40 Homemade Cards that Kids can Make for ideas. 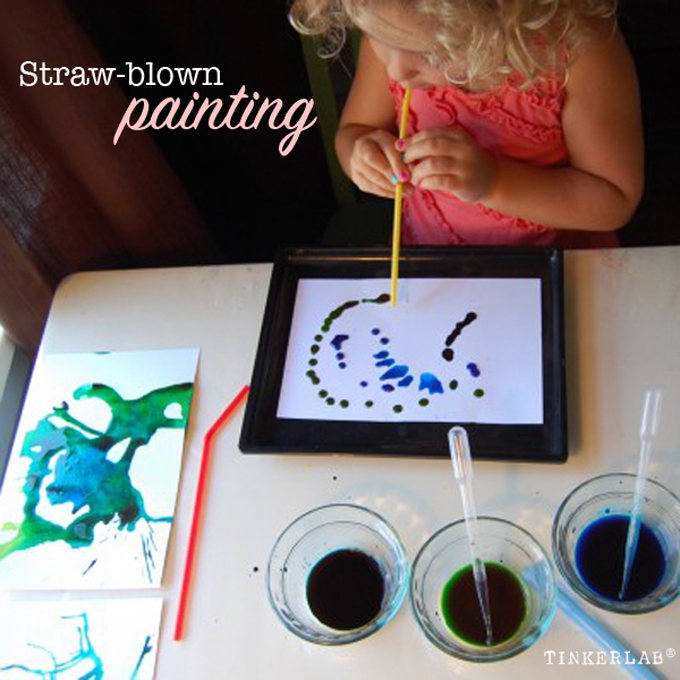 Dip the end of a straw into tempera paint and then use it as a stamp. Watch Art Tips and Tricks: 5 Non-traditional Painting Tools to see this in action. Bubble painting is such a fun painting process with completely unexpected outcomes. I did this with my preschool child and our experience follows. I’ll show you all the supplies you need for bubble painting and how to have a successful painting session. Aren’t these pretty? 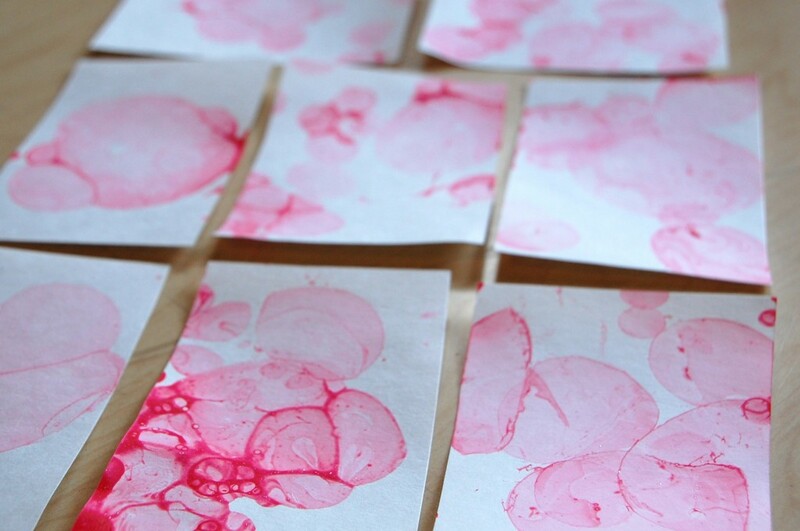 These are the result of a semi-failed experiment in bubble painting. The failure isn’t evident, is it? We had fun, experimented, and although this didn’t turn out as we expected, it was worth it! 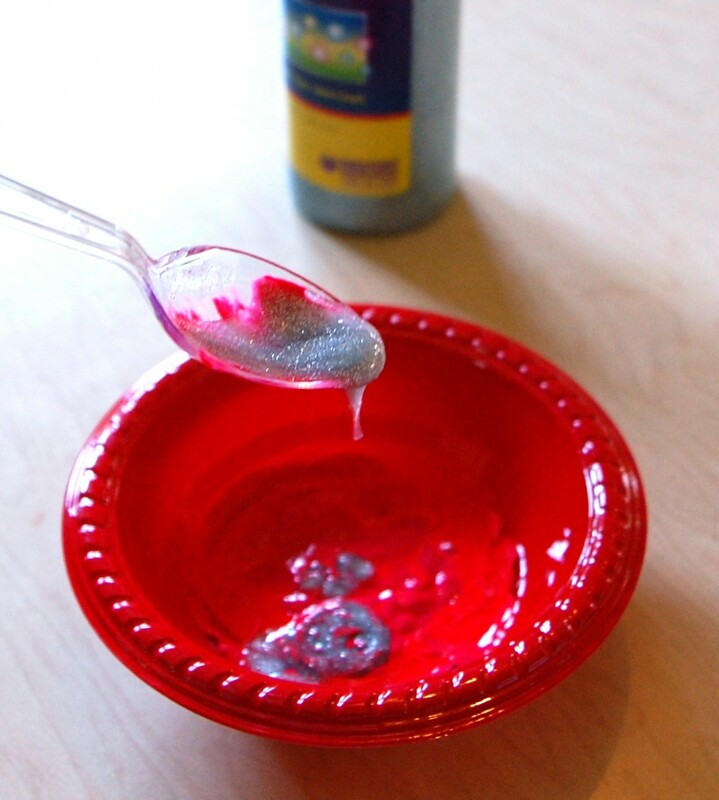 I started with a mixture of tempera paint (red with a little silver), dish soap, and a little bit of water to make it runny. We started with a natural dish soap from Whole Foods, and learned that while it’s great for dishes, it’s truly terrible for making good suds. 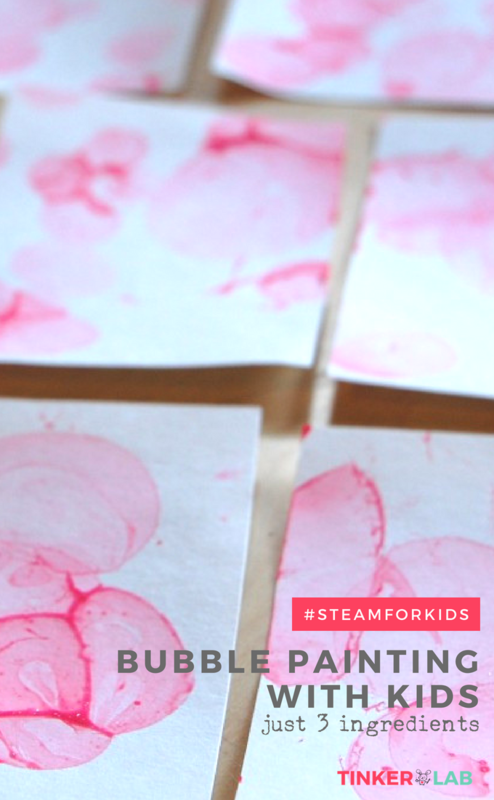 If you’re up for this project, Dawn or Joy are most likely the way to go for a bowl full of bubbles. 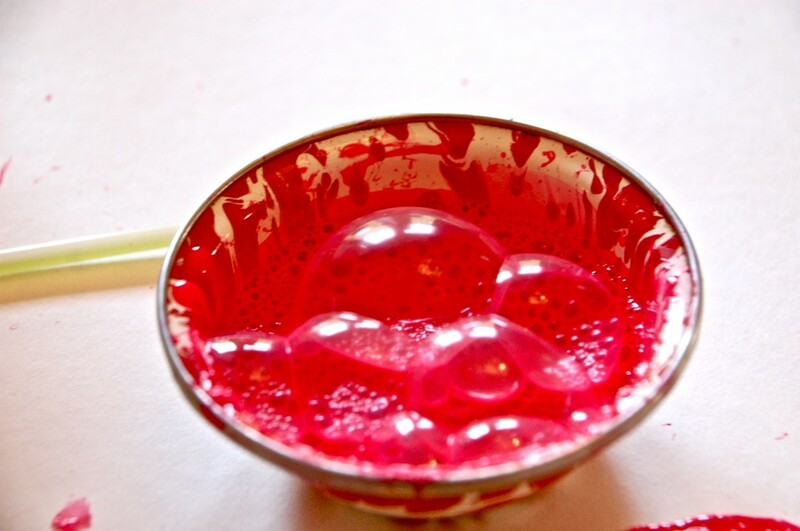 You’ll want to read our bubble paint recipe to get the best recipe and soap suggestions for this project. The bubbles in our session were pretty flat and we’ll try this again for sure. That was the first failure, but here comes one that’s even bigger. Can you guess what happened here? We poured the mixture into a little bowl, and then after I gave a short demonstration, I instructed my daughter to BLOW. Don’t forget to blow OUT. She did great, and then, “Oh no! Is that red paint all over your FACE?” I’m a terrible mom! Wash it out. Check the bottle. Phew, it’s non-toxic. Ack! Then she blew paint about five minutes but then just forgot what she was doing. Totally understandable. She’s only two, after all. And sometimes I forget that. 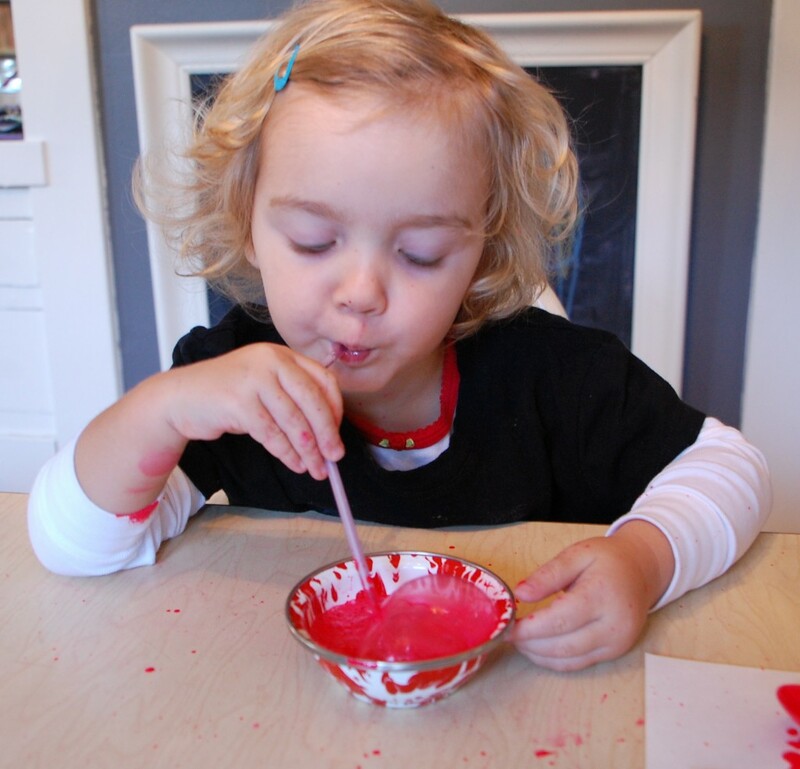 Bubble Painting Tip: MaryAnn Kohl has a good suggestion in Preschool Art (affilate) which I wish I had read beforehand: Pierce a hole near the top of the straw to keep your child from sucking paint into their mouth. After that short, freaky interlude, we resumed Project Bubble Paint. From this point forward, I was responsible for blowing bubbles. And they make for delightful gift tags, don’t you think? If you enjoyed this, I know you’ll love the Best PlayDough Recipe Ever. It’s been used by thousands of people with so much success. 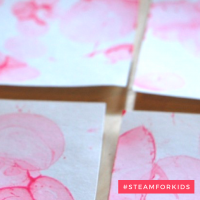 Some of my other favorite art experiments and recipes for kids are: How to make Slime, Vinegar and Baking Soda for toddlers and preschoolers, playful experiments with Flour and Water , and setting up a provocation with Flour and Chalk.